It’s that time of year when fish keeping moves outdoors to enjoy the spring and our pond fish vats fill with colourful hardy fishes. 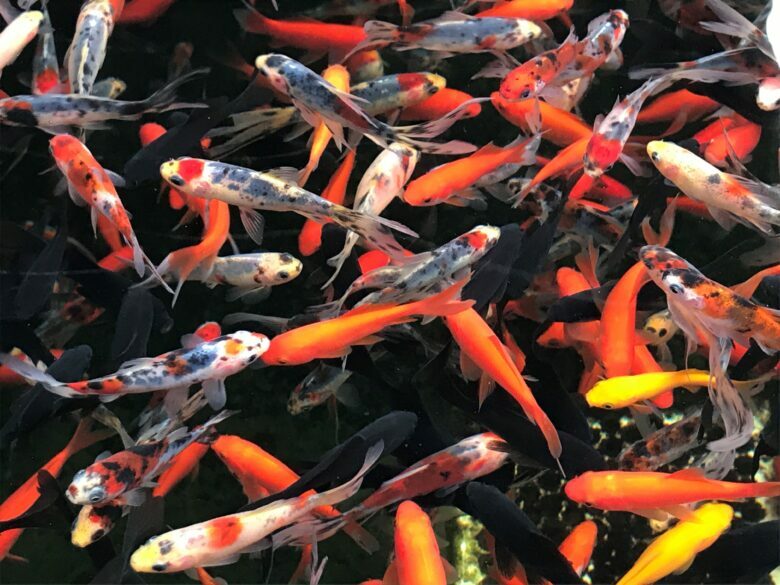 For most garden ponds, the rainbow hues of goldfish varieties (Carassius auratus) such as comets, shubunkins, canaries and sarasas can provide colour and movement in a convenient package without the demands on space and filtration that koi make. 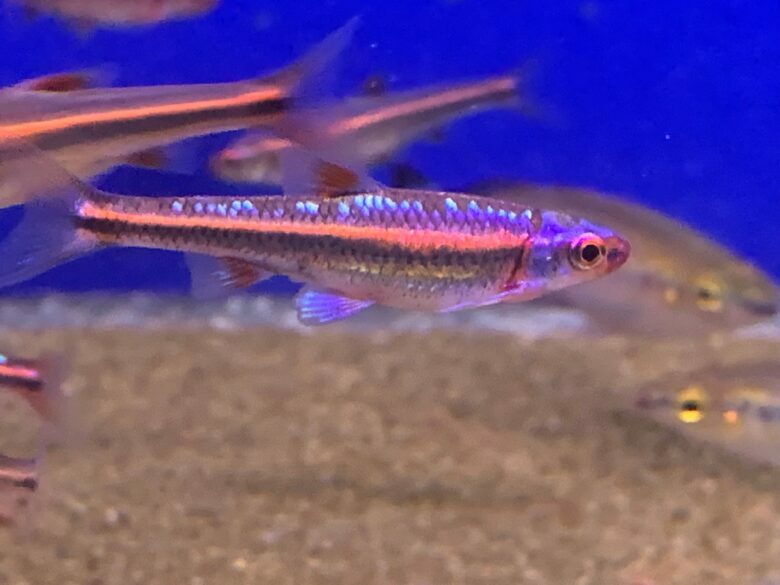 Of course, koi are well worth the effort but that’s a subject for another time..
Spring comes to temperate fishes too and in the case ofRainbow shiners (Notropis chrosomus) it means that it’s time for the males to wear their metallic blue courting colours. This male at our Cirencester store is just starting to get into his finery and this is part of the reason why these fish are best kept cool, as without the seasonal temperature variation they lack the switch that triggers them to look their best. A visit to our Crawley store is often like a trip to the sweet shop and the well stocked coral trays often look good enough to eat. Spoilt for choice with a range of photogenic fishes and inverts, it was a particularly vibrant section of the LPS tray that won its place on this page. 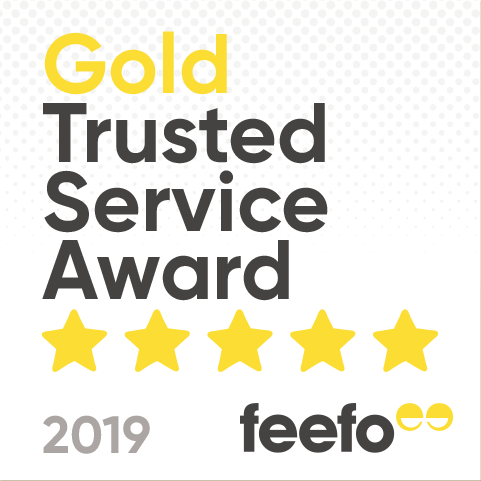 It’s currently a little confusing talking aboutReefkeeper Windsor , as it has the distinction of being that rare store that has moved and taken the name with it, meaning that for a brief period it is one store in two locations. The new store promises to be our best marine specialist site yet and stocking has begun already prior to the official opening. 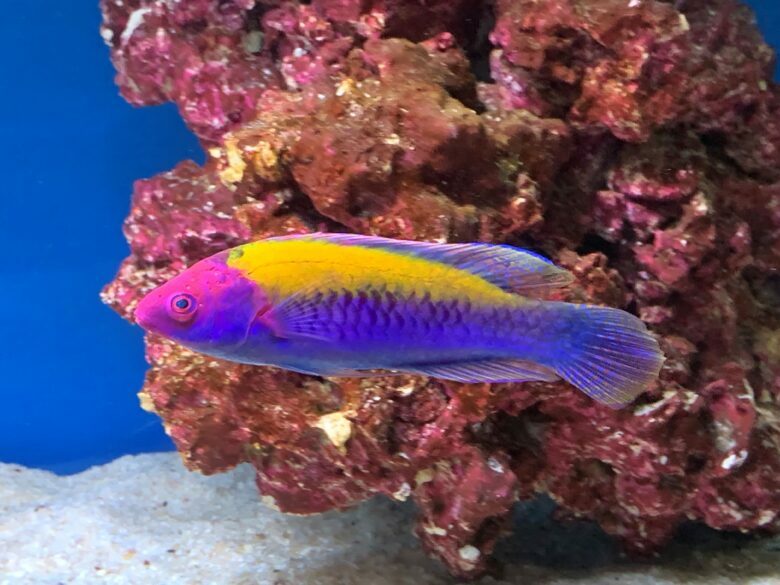 This stunning male Orange-back fairy wrasse (Cirrhilabrus aurantidorsalis) is one of the treats waiting for the doors to open officially that caught my eye during a sneak preview. 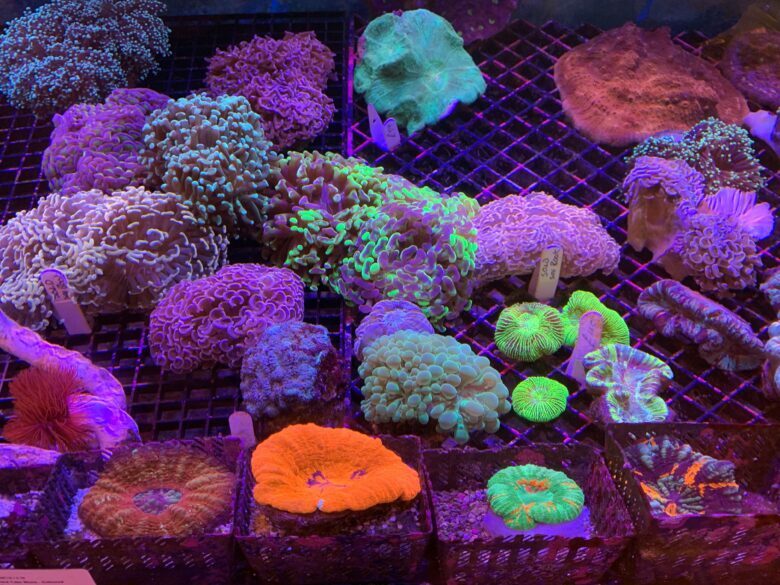 The original site will become our Dedworth store and will specialise in tropicals, having some fantastic opportunities to stock the coral trays and huge display tank left behind with interesting trops. 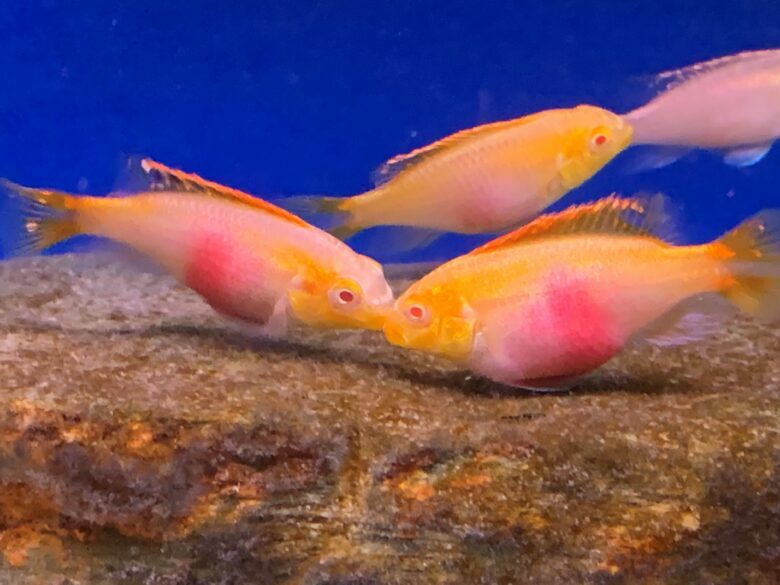 Albino varieties can be something of a marmite issue in the fish keeping hobby but it was hard not to be struck by the vigour of the Albino Kribs (Pelvicachromis pulcher) seen during a visit to Coventry . With their bright pink bellies as war paint, two females were disputing a territorial boundary whilst their males looked on. As with most dwarf cichlids, care should be taken that any community set ups provide ample room for territorial fish to defend their spawning site without harming their tank mates. 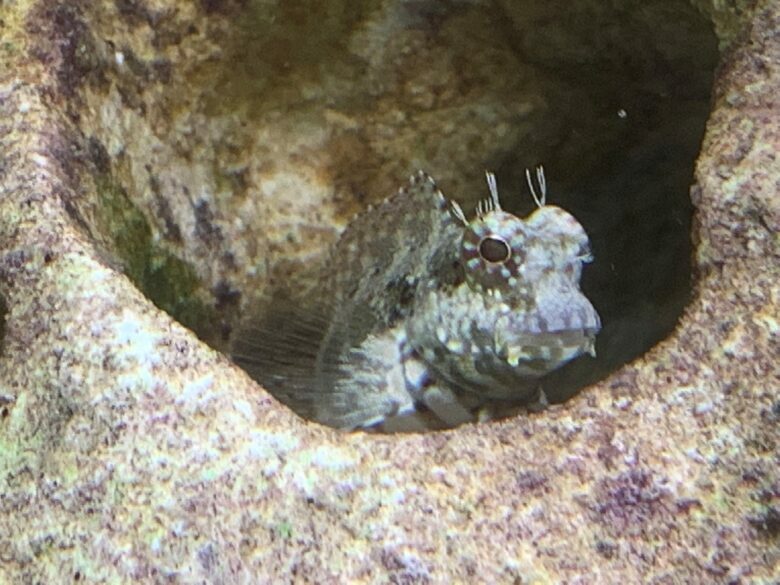 Some fish seem more interested than others in the goings on outside of their tank and one such individual was this Algae blenny (Salarius fasciatus)that was happily watching the world go by from the safety of its chosen hideout in our Leicester store. A combination of great character and an appetite for microalgae make these hard working fishes a popular choice for marine tanks. 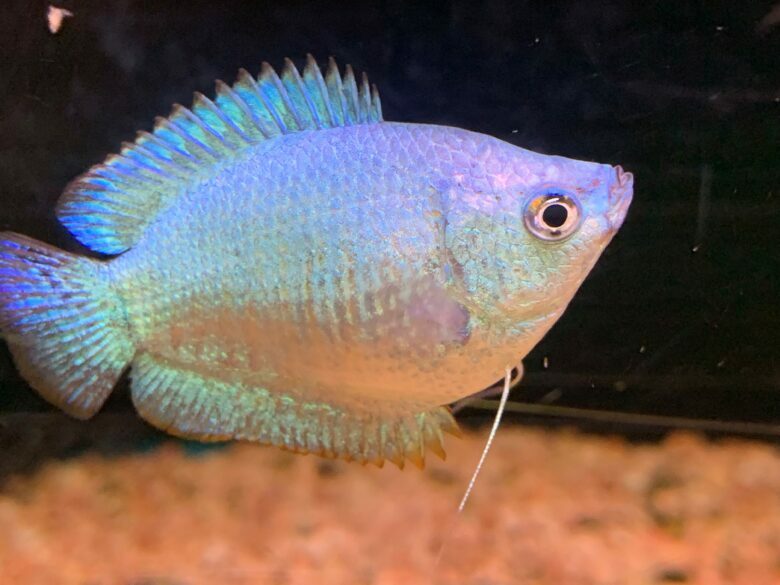 A species popular with fish keepers for decades, Dwarf gouramis (Trichogaster lalius) have undergone a number of changes, including an updated scientific name. Now bred in a variety of colour forms, including this blue female pictured at Swansea Enterprise Park , they’re also prone to viral issues that make sourcing good specimens more challenging than before. Given good care and selection, they can make a good choice for those looking for a slightly larger contrast to small tetras etc. in the planted aquaria that provide a reminder of their ancestral swampland home. 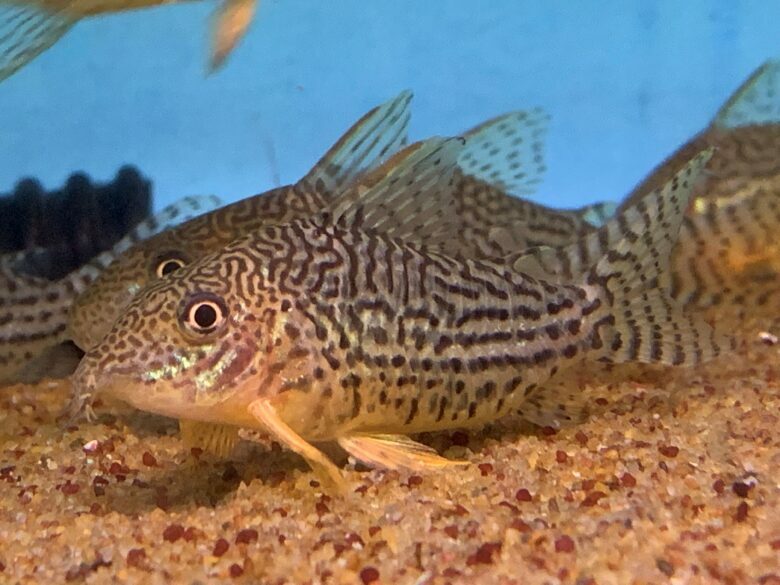 It’s an interesting phenomenon that Corydoras catfish seem to repeat - colour patterns shared in a long-nosed and a short-nosed species found alongside one another. It may be that they both gain protection through this mutual pattern in terms of camouflage, or given their defensive spines it may be sensible to carry the same warning for mutual predators: whatever the reason it means that the Mosaic cory(Corydoras haraldschultzi) is now a dead ringer for the commonly seen Sterba’s cory (C. sterbai). Both species have peach pectoral fins but the long-nosed haraldschultzi has a pale base with dark markings, whilst the sterbai is dark with pale markings. As these are all social fishes, the best answer is to go to our Newbury store and buy a group of each and marvel at them side by side.